The manufacture of metal office furniture has hidden problems which can make production of the end product frustrating and can slow up the production process. One such hidden problem is the presence of waste oil which builds up in the parts washer solution, leaving a film clinging to the metal surface when the build-up becomes too great. If any oil does remain on the surface, paint will not adhere and the part must be cleaned again. The HON Company, headquartered in Muscatine, Iowa, is one of the largest manufacturers of office furniture in the United States. They found a solution to the problem which paid for itself in one plant in four weeks by reducing the frequency of the cleaning solution recharges (and the additional cost) and eliminating the need for chemicals to break up the oil. In addition, the hassle of frequent recharging and sending back oil-covered parts are no longer necessities of metal furniture fabrication. Steel Manufacturers apply proactive coatings to their product to prevent rust and all Hon Industries divisions apply a protective coating or lubrication to dies and forming machines to extend the life of the dies and equipment. As the parts are washed to remove these coatings and ensure adhesion of the paint, this oil accumulates in the parts washer solution. The Oil Skimmers Model 5H is mounted on the tank and a flexible polyurethane collector tube continually travels on the surface of the solution attracting and carrying the oil along with it as it moves. The tube is then drawn up through scrapers and returned to the surface to collect more oil before any build-up can occur. Skimmed oil from parts washing solutions, as with machine tool coolant or cold rolling mill coolant, may tend to be frothy. 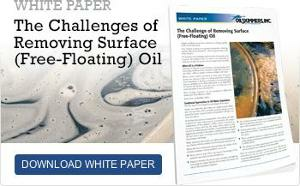 This froth generally is composed of a high percentage of solution which will eventually settle out in the recovered oil. The decanter permits small quantities of solution to break out of the skimmed oil and flow back to the solution reservoir rather than being discarded with the oil. Meanwhile, the solution-free recovered oil flows to the storage or collection tank for reuse or sale to a salvager. One of the HON Company's installations, at its Corry Jamestown Corporation’s Van Nuys, California plant, currently has two Oil Skimmers Model 5H units operating on parts washers. One was purchased in December of 1980 and the other in March, 1981. The initial investment was $4,622. The recovered oil was (and still is) sold to a reclaimer. Within four weeks, these skimmers had paid back the original investment as a result of reduced chemical costs and the increased cleaning power in the washer. The uncomplicated design of the Oil Skimmers, Inc. units ensures that virtually no maintenance is necessary. The systems keep working day after day, reducing downtime due to recharging as well as reducing the cost of the frequent new solution and the solvents used in the past to break up the oil. The sensitive painting operation is also made trouble-free, saving the hassle of paint that won’t stick due to oil-coated surfaces and the labor demanded to deal with the problem. Efficiency of operation and day-to-day operating costs are contributors to bottom-line performance. For the HON Company, the installation of the Oil Skimmers, Inc. oil recovery systems definitely helped to improve plant and bottom line performance.